The Islamic Centre of Cambridge is celebrating Canada Day on Sunday 01-July, 2018 from 11:00 AM – 3:00 PM with all it's community members. Come with your family, friends and neighbours to enjoy the delicious outdoor BBQ lunch (beef burger with drink) with us. Flag raising ceremony at 11:30 AM, national anthem and patriotic Canada songs will ensure a lively fun-filled afternoon for all. Outdoor water fun (water balloons & water sprinklers) bring your own water soakers/blasters, towels and an extra pair of clothing. On this joyous occasion, ICC is proud to offer vendors (a space in it's parking lot where they are going to setup their stalls free of charge) so interested vendors have contacted the office till Wednesday 27-June, 2018 by 4:00 PM and due to limited space, this opportunity was strictly on first come first serve basis. Other attractions: cotton candy, popcorn and freezies. You are requested to dress in red & white on this day to show your love and respect for this wonderful country that we live in. We are pleased to announce that ICC Summer Camp is starting from Tuesday 03-July, 2018 from 9:00 AM – 2:00 PM. If you register for 4 weeks of Summer Camp, then you receive 1 week absolutely free. 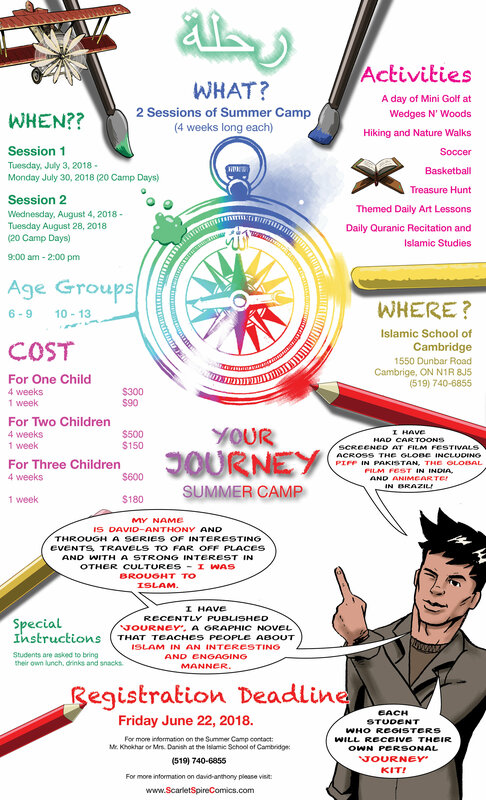 ICC Summer Camp includes weekly trips, daily fun games, activities & islamic education so we have a team of four young, energetic and very experienced individuals as staff members for the Summer Camp. Please come & register your children, these registration forms are available on the table in the lobby so please complete the registration form and bring it to the office. International School of Cambridge (ISOC) continues to take New Registrations for the Academic Year 2018-19 and with exceptional EQAO results, ISOC is proud of it's commitment to quality education. Help needed for cleaning the construction site. ICC wants help from the community to clean up the construction site on Saturday 30-June, 2018 at 11:00 AM. 20 Men are needed with their shoes on (no slippers) to avoid any injury so please remember that any service to the masjid provided by the community is sadaqa-e-jaariya. ICC’s Annual General Meeting (AGM) is scheduled for Sunday 15-July, 2018 at 2:00 PM. Flag raising ceremony, national anthem and patriotic Canada songs will ensure a lively fun-filled afternoon for all. Bike riding around the parking lot. On this joyous occasion, ICC is proud to offer vendors (a space in it's parking lot where they can setup their stalls free of charge) so interested vendors must contact the office no later than Wednesday 27-June, 2018 by 4:00 PM and due to limited space, this opportunity is strictly on first come first serve basis. We are pleased to announce that ICC is organizing an exciting Summer Camp for Children from Wednesday 04-July, 2018. A newly convert Muslim lady lost her rug on the Eid Day, while praying outside and that rug had pictures of small animals on it & had sentimental value for it's owner. The mat was borrowed on the day of Eid by another lady and not returned to the owner so we request that if you or anyone you know has it, then kindly return it to the office and please note that the rug was not an actual prayer mat. Khatam-ul-Quran will be on Sunday Night | 10-June, 2018 so it will be 27th Night of the month of Ramadan. Please come and join us for an all-night program and Suhoor will be provided by Brother Azim Malik & family. An Eid Day will fall on Friday 15-June, 2018 inshallah so do come and celebrate with us. Takbeerat will start at 8:15 AM and Eid Prayer Iqama will be at 9:00 AM. We may have an overflow of people, so you may need to bring a Prayer Mat and sound system will be available throughout the building as well as outside in the parking lot (just in case). Right after the prayers at about 9:30 AM, An Eid Fair rides & other attractions will be available in the parking lot and the rides include Trackless Train, Swings, Basket Ball, Bungee Run, Bouncer, etc. Ticket $10 per person and the ticket includes unlimited rides & food (except Ice Cream) so Food Serve Policy — All You Can Eat—No Take Home Please! We are looking for Volunteers, who would help us on Eid Day | Friday 15-June, 2018 between 9:30 AM to 1:30 PM. Volunteers need to contact/notify the office prior to Tuesday 12-June, 2018 and the office will remain closed on 14th & 15th of June, 2018. High school students are encouraged to apply and they will earn their volunteer hours as well as free food tickets so they will start their volunteering at about 9:30 AM and end at 1:30 PM (6 hours mandatory). We are pleased to announce that ISOC is organizing an exciting Summer Camp for Children from Wednesday 04-July, 2018. There are 3 Paid Positions available to run our Summer Camp this year so the applicants must be between 15 to 30 Years of age. The applicant must have been a student this year and will be attending school/college/university next school year, for more details please check with the office. Daily Iftaar & Dinner is continuing to be served during the last few days of Ramadan so please contact the office, if you like to book a day for providing Iftaar & Dinner to the Masjid. We would like to thank everyone who helped us regarding the Polling Station at the ICC facilities for yesterday’s Ontario Elections. Please note that "Annual Fundraising Dinner" is scheduled for this Sunday 03-June, 2018 at 6:45 PM. We are privileged to have Dr. Munir El Kassem as our guest speaker so the event is free for everyone, please come along your friends and family.